The White House press secretary is offering reassurance that President Donald Trump “likes and respects” British Prime Minister Theresa May “very much” following an interview in which he said she was ruining what her country stands to gain from Brexit. Trump also told The Sun newspaper that May’s “soft” blueprint for the U.K.’s future dealings with the European Union would probably “kill” any future trade deals with the United States. The interview was published Thursday as Trump was leaving a black-tie gala hosted by May. Trump is set to have tea with Queen Elizabeth II on Friday. President Donald Trump says he’s not nervous about meeting Queen Elizabeth II on Friday. The queen, the president and first lady Melania Trump are expected to have tea at Windsor Castle on Friday. President Donald Trump says he doesn’t feel welcome in London, and he blames that in part on Mayor Sadiq Khan. The American president reveals in an interview with The Sun newspaper that he has been told about a 20-foot “Trump baby” balloon that will be flown above Parliament Square on Friday as protesters march. Trump blames the atmosphere and recent terrorist attacks there on Khan, who is a Muslim. Khan has been outspoken against Trump’s Muslim policy in the United States. Trump says Khan has done a “terrible job” standing up to terrorists. Khan gave protesters permission to fly the 20-foot-tall balloon depicting Trump as an angry baby in a diaper. President Donald Trump says Europe is “losing its culture” because of immigration from the Middle East and Africa. It wasn’t clear what areas he meant. The explosive interview was published during Trump’s visit to Europe. President Donald Trump says he thinks Britain’s ex-foreign Secretary Boris Johnson would make an “excellent” prime minister. The comment was published in The Sun newspaper just as Trump was leaving a black-tie gala hosted by current British Prime Minister Theresa May during Trump’s maiden visit to the U.K. as president. Trump also says that he was “very saddened” to see Johnson was leaving government and said he hoped “he goes back in at some point. President Donald Trump has accused British Prime Minister Theresa May of ruining what her country stands to gain from Brexit and says her “soft” blueprint for the U.K.’s future dealings with the European Union would probably “kill” any future trade deals with the United States. He also told the tabloid that he had shared advice with May during Britain’s negotiations with the EU, but says May ignored his advice. Details from Trump’s interview with the paper became public as he was attending a black tie dinner with May to welcome him to Britain. President Donald Trump and his wife, Melania, are being greeted with pomp and circumstance, along with protesters, as he arrives at spectacular Blenheim Palace for a gala dinner. Anti-Trump protesters with critical signs are lining the roadway leading to the palace near Oxford. But it’s unlikely the Trumps even saw them. Instead, the couple arrived via helicopter and was driven by presidential limousine onto the property, where they were welcomed by British Prime Minister Theresa May and her husband Philip. First lady Melania Trump is wearing a yellow silk pleated chiffon dress by New York-based J. Mendel to a gala at Blenheim Palace. President and Mrs. Trump are having dinner at the palace with British Prime Minister Theresa May and her husband Philip. Blenheim Palace is Winston Churchill’s birthplace. A similar dress in emerald, originally priced at $6,990, can be found online for $4,194. J. Mendel’s website says the design house is a fifth-generation French atelier now based in New York. President Donald Trump and his wife, Melania, are on their way to a black-tie gala at Blenheim Palace near Oxford, England, where they’ll be joined by British Prime Minister Theresa May. The dinner is Trumps’ official welcome to the U.K. during their first visit since Trump’s election. The president wore a tuxedo and Mrs. Trump wore a pale yellow gown as they boarded a helicopter to the gala. Audible jeers could be heard from protesters as Marine One lifted off from London. Blenheim Palace is the birthplace of Winston Churchill, for whom Trump has expressed admiration. He reinstalled a bust of Churchill in the Oval Office shortly after his inauguration and screened the 2017 film “Darkest Hour” at the White House last winter in a sign of his affinity for the British leader. NATO chief Jens Stoltenberg says that despite President Donald Trump’s fire-and-brimstone approach to this week’s summit, the U.S. president has had an impact on the commitment by alliance members to boost their individual military spending. Since taking office, Trump has been criticizing most alliance members for not spending more on their militaries and pressing them to do more. Stoltenberg says Trump’s approach is paying off. The NATO secretary-general says allies have added $41 billion extra for defense spending — a figure he cited on Wednesday. President Donald Trump has arrived in Great Britain for his first visit as president amid NATO tensions, protests and Brexit turmoil. Air Force One has landed at London Stansted Airport, where Trump is beginning a four-day visit to the country. Trump will attend a gala dinner Thursday with British and American officials at Blenheim Palace, the ancestral home of former Prime Minister Winston Churchill. Widespread protests of Trump are expected during his visit to the U.K., which comes during a tumultuous week for May’s government as it seeks to navigate the Brexit process. Trump is arriving following a chaotic NATO summit. U.S. President Donald Trump is forecasting an unspecified “escalation” between the U.S. and Iran. Trump also says Iran is treating the U.S. with more respect, though there is no evidence to support Trump’s claim. Trump withdrew the U.S from the Iran nuclear deal earlier this year, reinstating economic sanctions that had been lifted under a deal among Iran, the U.S. and other world powers in exchange for curbs on Iran’s nuclear program. Trump was asked about Iran at a news conference in Brussels, where he wrapped up his participation in a NATO summit. French President Emmanuel Macron has rejected President Donald Trump’s claim that NATO allies have agreed to boost defense spending beyond 2 percent of Gross Domestic Product. The summit statement affirms a commitment made in 2014 after Russia annexed Crimea that NATO allies would halt defense spending cuts and start spending more as their economies grow, with the aim of moving toward 2 percent of GDP within a decade. U.S. President Donald Trump is offering assurances that the United States will “ultimately” work out a “pretty nasty trade battle” with China. The Trump administration has threatened to impose 10 percent tariffs on another $200 billion worth of Chinese imports, and Beijing has vowed to retaliate. It follows the U.S. imposing 25 percent duties on $34 billion of Chinese goods, which China responded to by increasing its own taxes on the same amount of American imports. U.S. President Donald Trump says Russian President Vladimir Putin is neither friend nor foe. Instead, the U.S. leader calls Putin a “competitor” and says he is representing the best interests of the Russian people as he represents those of Americans. Speaking during an unscheduled press conference at the NATO summit in Brussels, Trump says his sit-down with Putin will be “just a loose meeting,” but said significant progress could be made in the relationship. The U.S. and Russia leaders are to meet Monday in Helsinki. Trump’s meeting with Putin has been met by skepticism from NATO allies concerned that he will not be sufficiently tough with the leader. Trump says he will raise Russian election meddling in Western elections with Putin. Thousands are gearing up in London to protest U.S. President Donald Trump’s first official visit to the U.K. because of anger over his policies on issues ranging from immigration and race relations to Russia and the Middle East. Demonstrations are planned Thursday outside the U.S. ambassador’s residence in London, where Trump will stay, and Winston Churchill’s birthplace at Blenheim Palace, where he’ll attend a black-tie dinner. The biggest protests are set for Friday, when demonstrators plan to march through central London and float a huge balloon depicting Trump as a baby in diapers over the Houses of Parliament. The National Police Chiefs Council says rest days for officers have been cancelled and many will be working 12-hour shifts during Trump’s visit. U.S. President Donald Trump says he’ll raise election meddling and arms control when he and Russian President Vladimir Putin meet next week. Trump also says he is “not happy about Crimea.” Russia annexed the Crimean Peninsula from Ukraine in 2014. Trump continues to blame his predecessor, President Barack Obama, for allowing that to happen. Speaking at a news conference during a NATO summit in Brussels, Trump says Thursday that alliance members “actually thanked me” for meeting with Putin. Trump has been criticized for seeking the one-on-one meeting with Putin, scheduled for Monday in Helsinki, in part because of Russian meddling in the 2016 presidential election. The president is speaking at a news conference in Brussels along the sidelines of the annual NATO summit. He says he successfully pushed for NATO members to spend more of their budgets on defense and at a faster pace than previously expected. Trump says NATO is “more coordinated” and there’s a “better spirit for NATO” even amid reports that he threated to pull the United States out of the alliance in a dispute over defense spending. Published reports Thursday said Trump had threatened during the NATO summit in Brussels to pull the U.S. out of the military alliance in a dispute over defense spending. Trump says at a news conference that he was “extremely unhappy” with the situation, but that alliance members have upped their commitment in response to his complaints. U.S. President Donald Trump says he told NATO allies that he was “extremely unhappy” with the level of defense spending but received a commitment from the member nations for them to spend more. Trump says during a news conference in Brussels that NATO members have agreed to pursue defense spending of at least 2 percent of their GDP at a faster rate than the current 2024 timeline. U.S. President Donald Trump says the U.S. commitment to NATO “remains very strong” despite reports that he threated to pull out in a dispute over defense spending. Trump says at a news conference Thursday in Brussels that he told “people” that he would be “very unhappy” if they didn’t increase their commitments. President Donald Trump plans to make a statement at the NATO summit in Brussels. The White House says the president will address reporters before he departs for the United Kingdom, the next stop on his weeklong visit to Europe. 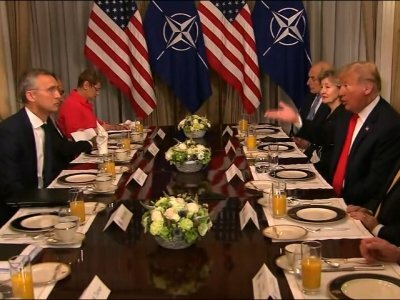 The statement follows tense discussions at the summit over Trump’s criticism of most NATO allies for not spending 2 percent of their GDP on defense as well as his demand that they immediately double such spending. Trump also criticized Germany over a natural gas pipeline deal with Russia. Two officials at the summit say the alliance is currently meeting in an emergency session amid Trump’s demands. President Donald Trump has arrived at NATO headquarters, where he’s attending a second day of meetings with leaders of the military alliance. Trump was running behind schedule Thursday morning and arrived at the Brussels site a good half an hour later than expected. A meeting of the North Atlantic Council with Georgia and Ukraine that Trump was scheduled to attend was called into order around 8:50 a.m. Trump arrived around 9:15 a.m.
Other leaders have also been trickling in, and continue to arrive after Trump. The president is expected to meet with the leaders of Azerbaijan, Romania, Ukraine and Georgia before he travels to London Thursday.